This week the guys review Guardians of the Galaxy Vol 2. Does the highly anticipated sequel to the surprise 2014 hit deliver? Is Marvel still the unbeatable powerhouse? Is James Gunn a genius? The guys explore all this and more as they review Guardians of the Galaxy Vol 2. Be warned there are spoilers ahead. Enjoy! This week the guys are talking Guardians of the Galaxy. Guardians is quickly becoming know as the best Marvel movie so far, but not all the hosts share this sentiment. Though they all enjoyed the film, found out why one of them can’t agree it’s the best Marvel movie to date.. Together they break down the film and all the performances from Chris Pratt as Peter Quill/Star-Lord, Zoe Saldana as Gamora, Dave Bautista as Drax the Destroyer, Vin Diesel as Groot, and Bradley Cooper as Rocket. One of the best ensemble casts thus far. Also was Lee Pace as Ronan the Accuser a great villain? And did Karen Gillan’s performace as Nebula surprise you as well? So site back strap in and enjoy the ride as we talk Guardians of the Galaxy. Warning: Spoilers ahead! Please help our show by taking 2 minutes to fill out a short survey! #stumpthegeekspeak question of last week: In the before Watchmen books it was revealed the 2 of the Minutemen had a sexual relationship. Which 2 was it? #stumpthegeekspeak question of the week: The same accident that gave Daredevil his powers created 4 other heroes. Who were those heroes? VERY nerdy show today off the back of all the happenings (Nothing to do with M Night thankfully) at SDCC and big The Wolverine movie review! Drive through liquor stores: Only in Australia? Comic News Insider: Episode 437 is now available for free download! Click on the link or get it through iTunes! Sponsored by Dynamic Forces. Back in the rotating guest co-host chair this week is Gretchen Souerwine! It’s been awhile but she comes well prepared and researched plus brings her professional news reader voice. Also joining Jimmy, is artist David Reuss. He discusses his work, being on the board of the Society of Illustrators, their recent acquisition of MoCCA and more! Gretchen and Jimmy talk some of the new fall TV shows like Elementary and Park Avenue 666 and wax on way too long about theDoctor Who midseason finale. News includes: Grant Morrison reveales Multiversity, Patrick Stewart may be back in X-Men, FOX signs Mark Millar, Asians in comics exhibit in NYC, LUST from Ben Templesmith, Steve Niles and menton3, and Halloween Comic Fest 2012 coming on Halloween. As always, listener feedback, Top 3 and more! Leave your iTunes comments! 5 stars and nothing but love! New York Comic Con is coming up next week from October 11th-14th! Comic News Insider will have their booth again in the Podcast Arena! Come by and visit #3350 for signings, interviews and our annual fundraising raffle where you can win great swag! Signed comics, toys and more! The schedule of events at the CNI table will go up next week! Producer Joe will be there as well taking donations for The Project Solution and giving away messenger bags with original Paul Pope art (also signed/numbered) as a thank you gift for donation $30 cash or $32 credit. We’ll also have some official CNI photographers roaming around taking pictures so look for a massive photo album coming the following week. SO MUCH GOING ON! 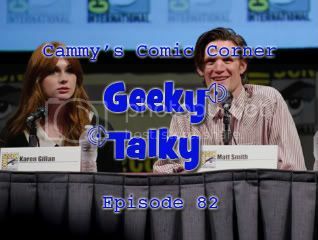 This week, we take a break from the comics and review “The Angels Take Manhattan”, Doctor Who’s farewell to Amy and Rory. We have one guy who’s #KindaNewToWho, one who #HatesWho and the other who’s #GettingRealTiredOfWho. Listen in! What did you think of the mid-season finale? Head over to our podcast Facebook page and let us know. Comic News Insider: Episode 433 is now available for free download! Click on the link or get it through iTunes! Sponsored by Dynamic Forces. Jimmy flies solo so the episode doesn’t run too long! All those pesky guest co-hosts talk too much. Sheeesh. Jimmy sat down with director Emily Hagins about her new film My Sucky Teen Romancealong with her other film work. Loyal listeners will remember that Emily was on the podcast a few years back with her first feature film Pathogen. This amazing 19 year old has done 3 features! Listen to them chat about zombies, vampires, ghosts, comedy and just generally nerd out over film. Jimmy also spoils the Doctor Who premiere that aired last Saturday. News includes: Joss Whedon brings S.H.I.E.L.D. to TV, Marvel teases Dark Phoenix return, Hickman’s Avengerslineup announced, BBC’s Sherlock gets the manga treatment, and Michael Emerson is The Joker! As always, listener feedback, Top 3 and more! Leave your iTunes comments! 5 stars and nothing but love! In this special episode I’m once again joined by my companion Sarah Jane Smith to discuss the last three episodes of this season of Doctor Who: The God Complex, Closing Time, and The Wedding of River Song. Spoilers! In this special episode I’m once again joined by my companion Sarah Jane Smith to discuss the next three episodes of Doctor Who: Let’s Kill Hitler, Night Terrors, and The Girl Who Waited. Spoilers! In this final Comic-Con 2011 recap for Sunday, I’m joined by Jeremy Awesome and Sarah (Dr.) Jones to discuss Doctor Who, voice acting, and our thoughts on the convention as a whole. This episode has been brought to you by 01 Publishing.